Description: Tiruvotriyur is a famed Shivastalam to the North of Chennai in Tiruvotriyur. The three Shivastalams in (and around) Chennai are Tiruvanmyur, Tirumayilai and Tiruvotriyur. This is the 20th of the 32 Tevara Stalams in the Tondai region of South India. Tiruvotriyur is a well renowned shrine known for Tyagarajar, and for the grandeur of the temple and the festivals celebrated. Tyagarajar's dance here is Sundara Natanam. Tiruvotriyur is not one of the Saptavitanka Stalams of Tyagarajar, although the Tyagarajar shrine here is of great relevance. The Temple: The Moolavar here (Aadipureeswarar) is a Lingam of earth, covered with a kavacam, removed only on the occasion of Kartikai Full Moon. The Tripada Trimurthy image combines the essence of Shiva, Vishnu & Bhrama & shows the latter two engaged in worship of Shiva. History: Pattinathar & Ramalinga Adigal have sung praises of Otriyur. Tiruvotriyur is known for its close association with Sundaramoorthy Nayanar who was also closely associated with Tiruvarur, home to Tyagarajar and the foremost of the 7 Saptavitanka shrines. . Sambandar is said to have visited here after visiting Kalahasti, while Appar is said to have come here from Tirumayilai. This is a vast , well visited temple with an impressive Rajagopuram and prakarams. Inscriptions from the period of Parantaka Chola I and Uttama Chola are found in the pillars of the mandapams. 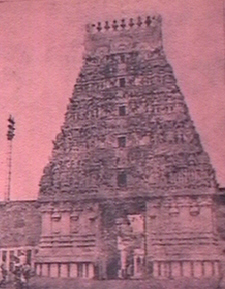 The central shrine was rebuilt later during the days of Rajendra Chola, who erected with black stone, the vimanam of Aadipureeswarar. Festivals: The grand festivals celebrated here are of great significance and are centered around the dance of Tyagarajar. Sundarar's association with Tiruvotriyur is celebrated widely. Sundarar is said to have married Sangili Nachiyar under the stala vriksham Magizha maram, where there is also a shrine to Shiva Aadipureeswarar. The samadhi and temple of Pattinathar, a devotee of Shiva are also located nearby. Much more needs to be said about Tiruvotriyur and Templenet will feature a special on Tiruvotriyur, Tirumayilai and Tiruvanmiyur in the near future.